DeNeile Cooper ’15 is majoring in anthropology, minoring in archaeology and working toward a certificate in environmental studies. She and three other members of the Class of 2015 created an interactive map for the Wesleyan that would allow Wesleyan parents, students and prospective students to navigate the campus in a more engaging manner. 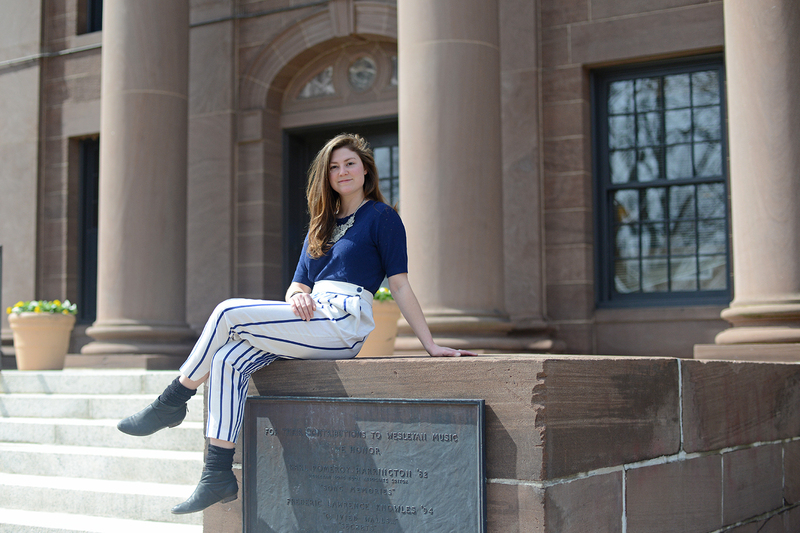 In this issue of News @ Wesleyan, we speak to DeNeile Cooper from the Class of 2015. Q: DeNeile, as part of a GIS (Geographical information systems) service-learning project, you’ve been working on a interactive campus map project. What is the purpose of the map? A: We wanted to create an interactive map for the Wesleyan website that would allow Wesleyan parents, students and prospective students to navigate the campus in a more engaging manner. 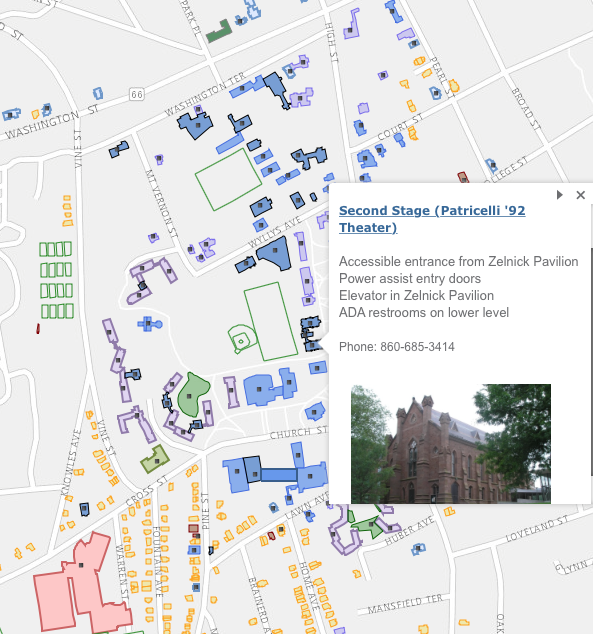 The interactive map not only illustrates every building on campus to-date, but color codes them according to their usage, for example, purple buildings represent dormitory halls, blue buildings represent academic buildings and offices, and yellow buildings represent woodframe houses. In addition, each building can be clicked on to reveal a pop-up with a photo of the building, details about its contents, and links for the building’s department or office contacts. We really wanted to synthesize the strengths of the current online map with the abilities available to an interactive map. The interactive map provides information about every building on campus. Each building is clickable and contains a pop-up that gives a photo of the building, a description, and external links to the departments, staff members, and web pages that further explain the building’s content and contact information. Q: How did you come up with this idea? Was there a need? A: In our Introduction to GIS course, Professor Kim Diver (visiting assistant professor of earth and environmental sciences) had been teaching us how to use GIS online to make interactive maps, or “Story Maps” that are accessible to the public. Our group, consisting of Katy Thompson ’15, Rebecca Sokol ’15, Chloe Holden ’15 and myself, worked with Wesleyan’s Physical Plant to create two updated versions of the Wesleyan campus map. We thought that this would be a perfect way to update the current map found on the Wesleyan website. We wanted to give the viewers the option to have both an aerial view of the campus and a detailed photograph and description of each building. Q: How does the interactive campus map differ from other Wesleyan maps? A: The interactive map takes the concept from the current online map of conveying an aerial view of the campus, but color codes the buildings by their use purpose. We hope that these colors makes it easier for new students and parents to more quickly locate the building that they want to find. Each building is clickable and contains a pop-up that gives a photo of the building, a description, and external links to the departments, staff members, and web pages that further explain the building’s content and contact information. Alternatively, the viewer can peruse each building by clicking the white up and down arrows located on the far left side of the screen. Our map is also unique in that we have extended the scope from the current map to include the many different athletic fields Wesleyan owns, and even Physical Plant and Long Lane Farm. We hope that this new map breadth will help new students get a more complete understanding of the full extension of our campus and the activities we have to offer here. Q: When will you launch the map? It is online now? A: We plan to launch the map later this semester. We have received feedback from various Wesleyan department and office staff members, and would like to make a few general adjustments before it goes up on the Wesleyan website. The most recent version of the map is available here. Q: How did you (and your team) end up designing and building this map? What software did you use and do you have any idea how many hours went into this? A: We actually started by working with the campus map that Physical Plant uses. It was last updated in 2011, so we used the latest 2014 database from Physical Plant to update the map. We deleted the buildings that had been torn down or sold, added the buildings that have been built or purchased, and added some of the athletic fields and Long Lane Farm. Physical Plant’s map was already coded by color for different building uses, so we just simplified a few of the building use distinctions to make them more user-friendly. All of this was done through the ArcMap software, so we then transferred the updated map onto ArcGIS Online and made it into a Story Map so that it would be interactive, engaging and accessible to the public. We spent many more hours than we could have anticipated working on this project. Just updating the old map took quite a bit of time, and that was something we had to do before we could even start making the online map. I would say each of the four of us put in 15 hours at the very least. Q: What did you learn in the process? A: I think we all learned a great deal about patience from the project. Many of the steps were so elaborate that we would spend a full hour working on something, step away from it, and not be able to readily tell what had been done. I personally gained a great deal of respect for the opportunities that ArcGIS opens up. There are so many stories, concepts and theories that can be more effectively communicated by using the tools that ArcGIS provides to create a map that is at once critically engaging and artistically appealing. Working on the project also deepened my appreciation for the work that Physical Plant staff members do each day. The database and map that we received from them was very thorough in its description for each building, and I think that’s indicative both of how much work the staff members put into making sure the university is run well, and how knowledgeable they are of the campus in a way that no student could conceive of. Paraphrasing artist Mierle Laderman Ukeles here, thank you, Physical Plant, for keeping Wesleyan alive. Q: What are you majoring in and what are your post-graduation plans? A: I am majoring in anthropology, minoring in archaeology and working toward a certificate in environmental studies. This summer I will be excavating in France with Professor Clark Maines, for whom I am doing GIS work this semester. My interests are a bit diverse, so I have applied to a few composting facilities in the area, as well as some archaeology positions and dance company positions. Q: At Wesleyan, what clubs or organizations are you part of? A: Currently, I am a co-leader of Collective Motion dance group and Wesleyan Composting Committee and a member of the Middletown Chapter of Alpha Delta Phi Society. I intern for the Archaeology Lab, the Sustainability Office and the GIS Department. I also participate in a variety of dance performances, so this semester I will be performing in Mabuhay and ESQUE.